Iraq – which was covered in the previous seven-nation order – has been removed from the new one after agreeing additional visa vetting measures. The new order was unveiled by Secretary of State Rex Tillerson, Attorney General Jeff Sessions and Department of Homeland Security John Kelly. “The fact remains that we are not immune to terrorist threats and that our enemies often use our own freedoms and generosity against us,” said Mr Kelly. Secretary of State Rex Tillerson, Attorney General Jeff Sessions and Homeland Security Secretary John Kelly held a joint news conference on Monday morning to discuss the new directive. Donald Trump has, at last, unveiled his new immigration order, and it looks like government lawyers – and not just White House political operatives like Steve Bannon and Stephen Miller – have had their input. The details of the action’s implementation are outlined with greater clarity this time, with more than a week before the new rules kick in. It’s still an open question as to what, if anything, this order will do to prevent violent attacks on US soil, given that past high-profile incidents have not involved individuals from any of the six named countries. Mr Trump had promised bold action on border security, however – the kind of move that would unnerve traditional politicians and anger civil liberties advocates. Although Mr Trump’s campaign-rally talk of sweeping Muslim bans are a thing of the past, his supporters will likely revel in the uproar and consider this latest move a campaign promise kept. Mr Trump had defended the lack of notice, tweeting that “if the ban were announced with a one week notice, the ‘bad’ would rush into our country during that week”. 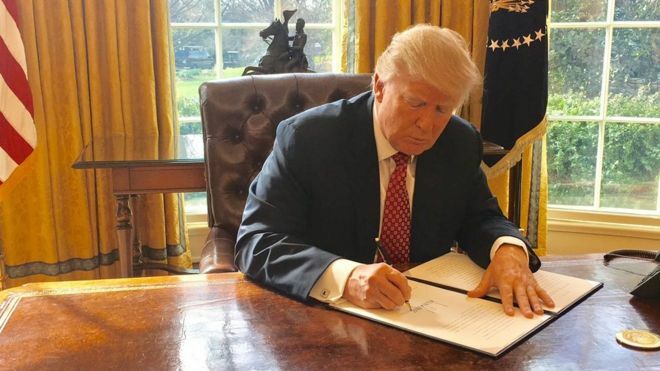 Be the first to comment on "Trump signs new travel-ban directive"